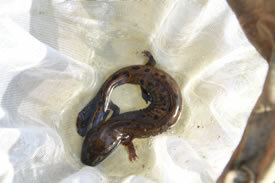 The mudpuppy, Canada’s largest salamander species, measuring from 25 to 30 centimetres in length. It is easily distinguished from other salamanders by its dark red and feathery external gills, an adaptation for a strictly aquatic lifestyle. This amphibian has a flattened head, wide tail, stubby legs and four toes on each foot. Its upper body is grey to reddish brown. It sports bluish black spots on its back and a grey belly. This species occurs in North America, from southern Manitoba, Ontario and Quebec, south to northern Louisiana, Mississippi, Alabama and Georgia. It is found at the bottoms of freshwater lakes, ponds, streams, rivers and reservoirs. Here, it hides among vegetation and beneath logs and rocks during the day. As it is a nocturnal species, it feeds at night. The International Union for Conservation of Nature has assessed the mudpuppy as least concern globally. It is also considered not at risk in Canada according to the Committee on the Status of Endangered Wildlife in Canada. However, this species still faces some threats. Pollution can cause birth defects and deformities. Siltation (the process where water becomes dirty from the movement of fine mineral particles) and being unintentionally caught and then released on land by fishermen are other threats. What is NCC doing to protect this species? Since 1974, NCC, the Nottawasaga Valley Conservation Authority and other key partners have protected more than 12,000 acres (4,972 hectares) of habitat in Ontario’s Minesing Wetlands, where mudpuppies have been documented. Important stewardship work such as tree planting, stream restoration and invasive species control have been done in partnership with NCC to help improve habitat in the Minesing Wetlands area.